Our school as been teaching Hungarian for over three decades. Qualified Hungarian teachers work with our own specially devised course materials. Courses run all the way from absolute beginner up to proficiency level. Our aim is to provide our students with practical, communication-based language skills for everyday situations. General Hungarian courses, 2-3 times a week, with a flexible schedule that suits you, in groups that are at your level. Once you’ve completed our free placement test, we’ll let you know your level and provide details about courses you can join. If your time is limited, or you would like to study within a short period, we recommend that you take an intentensive course. These are usually in the mornings, 4 or 5 lessons daily, 4 or 5 times a week. One-to-one lessons adapted 100% to your needs, with a flexible schedule, at the school or your location of choice (or online if you prefer). Fees are based on the requirements for the course. (From 4,500HUF/45 minutes) You can sign up by doing the online placement test, contacting us by telephone or e-mail, or in person at the school. Once you’ve completed our free placement test, we’ll let you know your level. Business Hungarian and Hungarian for professional purposes, tailored to your professional area and schedule, for groups or individuals (online also possible). Following written and oral placement testing, all participants in our business courses are placed in a group appropriate to their level. Fees are based on the requirements for the course. You can sign up by doing the online placement test, or by contacting us by telephone or e-mail. Once you’ve completed our registration form and free placement test. If you are preparing for a Hungarian language exam or the Hungarian citizneship test, and want to pass with confidence, choose one of our tailor-made preparation courses for the state accredited ITK Origó and ECL exams. You’ll get all the help you need to develop the skills required to successfully negotiate the tasks for the relevant exam. This course has been designed for English speaking university students who have come to Hungary to attend a semester at a Hungarian university. Babilon Language School holds an intensive course in conversational Hungarian during the two-week period immediately preceding Fall and Spring semesters both at Budapest Semesters in Mathematics, Budapest Semesters in Mathematics Education and at AIT-Budapest. We are confident that, like many previous course participants, you will find it a highly rewarding professional and cross-cultural experience. This language course is not part of the BSM or AIT-Budapest program; it should not be confused with the slower-paced Hungarian language course offered for credit by those schools during the term. However, our course has been designed specifically for BSM and AIT participants and has been tested and improved for over two decades. Would you like to learn the basic Hungarian phrases essential for surviving everyday situations in Budapest? Would you like to get a glimpse into the Hungarian culture? 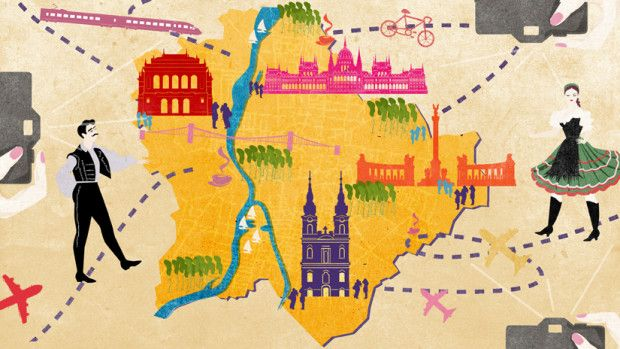 Are you interested in films, good food and discovering the hidden corners of Budapest? If yes, the Survival Hungarian course is made for you. Enroll on an 11-day long immersion course in Hungarian with Babilon Language School. Apart from your in-class language lessons with professional teachers, you will have the opportunity to use your knowledge in real life and acquire a better understanding of the most important components of Hungarian culture. The course also includes outdoor trips and activities where you will be able to practice some of the language elements from the course. The program includes an opening and closing session, cultural insights and a culinary evening on the first day of the course, language lessons at Babilon Language School, a guided tour of the downtown and a screening of a Hungarian movie introduced by a film critic. In addition, the school will also be offering optional events in the afternoons and at weekends, focusing on different aspects of history, art and design and Jewish heritage, and there will be trips to other cities outside Budapest. Please note that these are extracurricular events and additional charges will apply. If you decide to participate in the language course, we recommend that you arrive in Budapest a few days earlier to reduce your jet-lag before classes start. Please let us know in advance if you do not expect to arrive in time for the first day of classes. If you enroll through your university the fee is $350. Late application fee (if you apply less than two weeks before the beginning of the course) is $440 paid in Hungarian currency in cash at Babilon. The fee includes the textbooks. It does not include the dictionaries. The Babilon Language School is located in the heart of downtown Budapest, and is easy to reach by subway (called METRO in Budapest): Take the red subway line (indicated by large red “M” signs) to “ASTORIA” station. The school is on the corner of K aroly boulevard (Karoly krt) and Dohany street (Dohany u), across from the Main Synagogue, an architectural and cultural landmark. The school is on the 4th floor of the “Belvárosi Színház / Downtown Theatre” building (take the elevator).